Elon Musk's Tesla Motors threw a swanky party this weekend to show off the upcoming Model S electric sedan, promising to build a version that could beat a Porsche 911 to 60 mph. 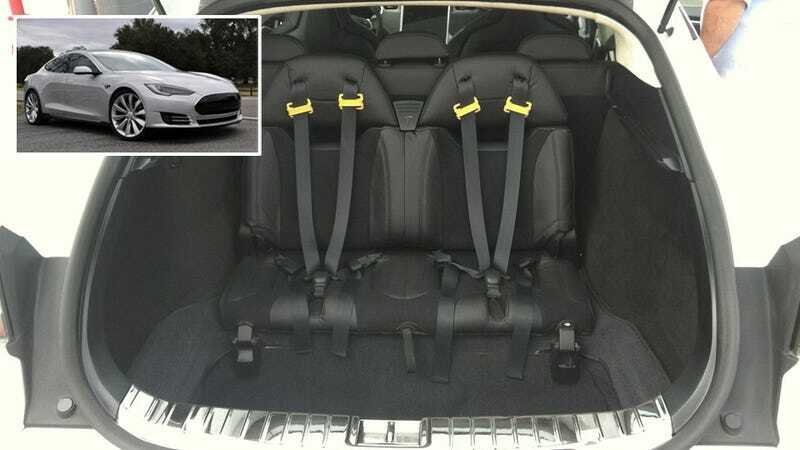 But the Model S also brings this — the return of rear-facing jump seats. Once standard in American and Swedish station wagons, rear-facing seats were never that popular; adults are inevitably too big for them, they take up cargo space and make some kids even more prone to decorating the rear window with barf. *No new model in the United States offers them today; every model with a useless third-row option like the Toyota RAV4 and Kia Rondo faces its unfortunate occupants forward, where their cries for mercy can be heard by their jailer. Despite looking dangerous, there's no U.S. safety rule prohibiting rear-facing seats; as long as they meet the safety requirements of front-facing chairs, they're OK. Putting them in a low-slung four-door sedan, even one with a large rear hatch, seems quirky to the point of obsessive. So why are they there? Because Elon Musk has five children, and wanted to be able to haul them all in the Model S at the same time. Hence the restriction on height, and the four-point safety belts — although once that new electric-car smell wears off late next year, riding in the wayback may not be so electrifying. *I stand corrected; the Mercedes-Benz E350 Wagon still rocks the back-facing kidseat.